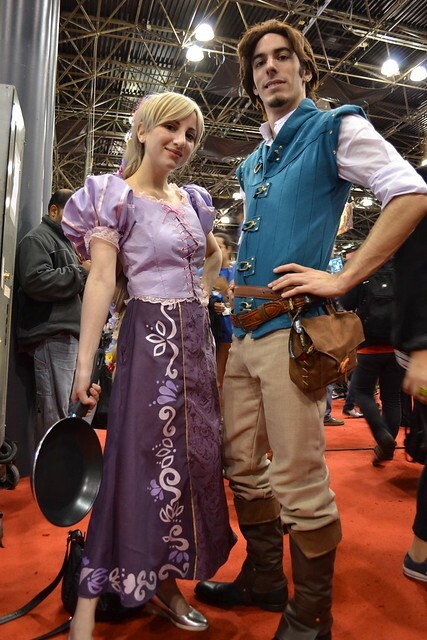 Finally, I have gotten the photos back from New York Comic Con. 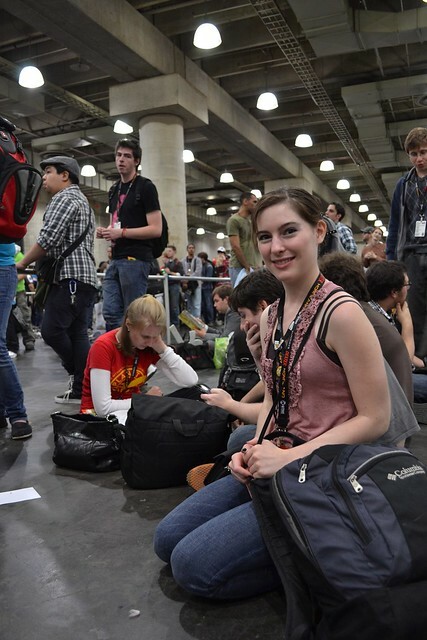 This year I headed into the city with a big group of friends to get our nerd on. 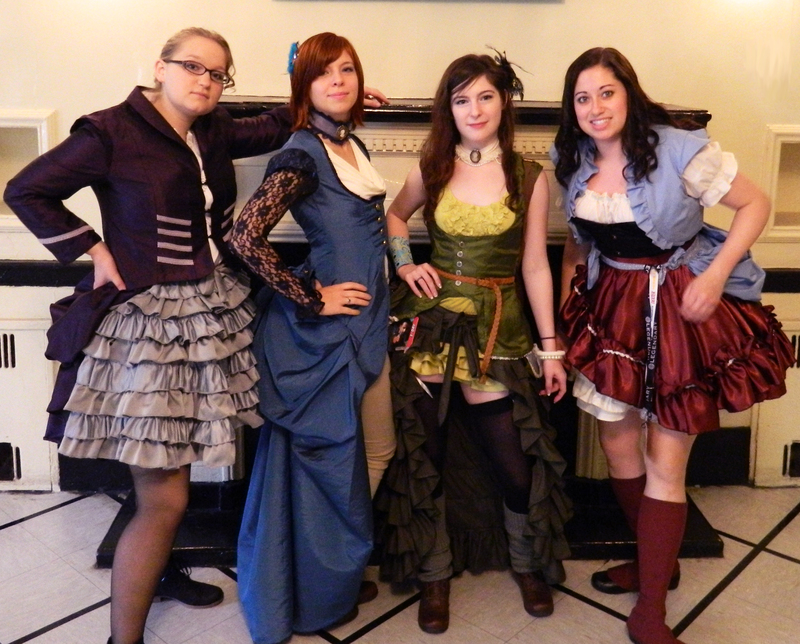 All the ladies in the group, four in total, attended the convention in steampunk. Below is my costume, mixed in with some group pictures including the other lovely ladies of my cosplay group, MetaCosplay. 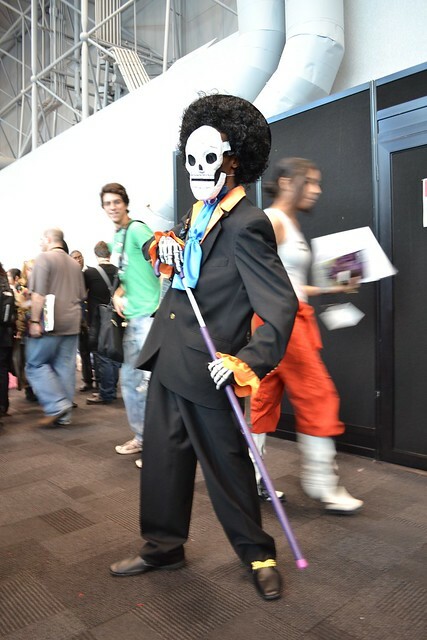 I find New York Comic Con to be too crazy and crowded of a convention to cosplay a popular character. There is no room to have your picture taken anyhow, and the days are so long that not having to worry about a wig or high shoes is really the only way to make it through. 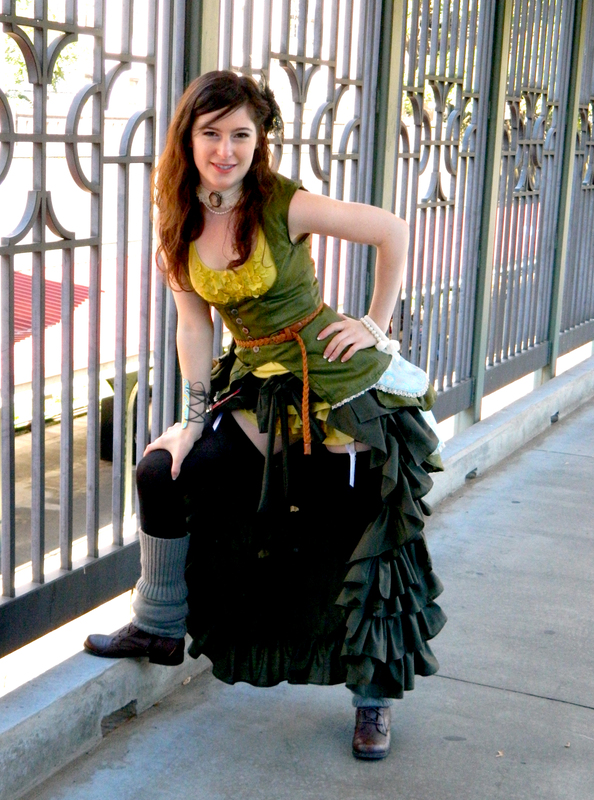 New York City is exhausting, so a comfortable steampunk or street clothes is the only way to keep me in a good mood after a long day of crowd-wading and line-waiting. This Steampunk is my own original design, imagined through an effort to make a steampunk the likes of which I have never seen before. The character is an American “business women” from the western frontier, who got into some “trouble” and had to “flee the country.” She is now essentially a high-class gypsy, traveling with friends and associates from both the U.S. and England. 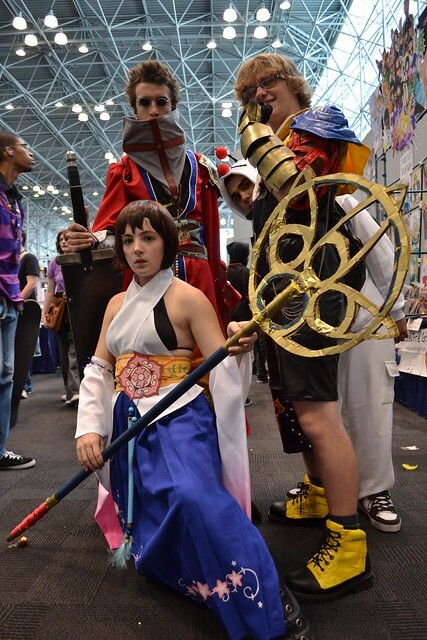 Our group was supposed to meet up with a photographer from Nerd Caliber on Saturday of the con to have some better pictures taken, but in the madness of the con and the lack of cell-phone service at the Javits, we never connected. 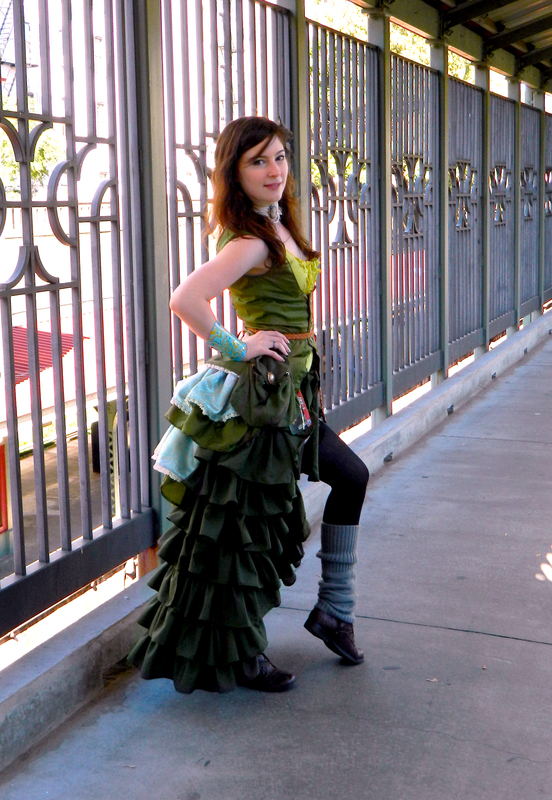 Which is just as well because I have some edits I would like to make to the accessorizing of this outfit. If the weather holds out a little longer, the ladies and I should be able to arrange a real photoshoot in early november. But for now, these pictures are all I’ve got. 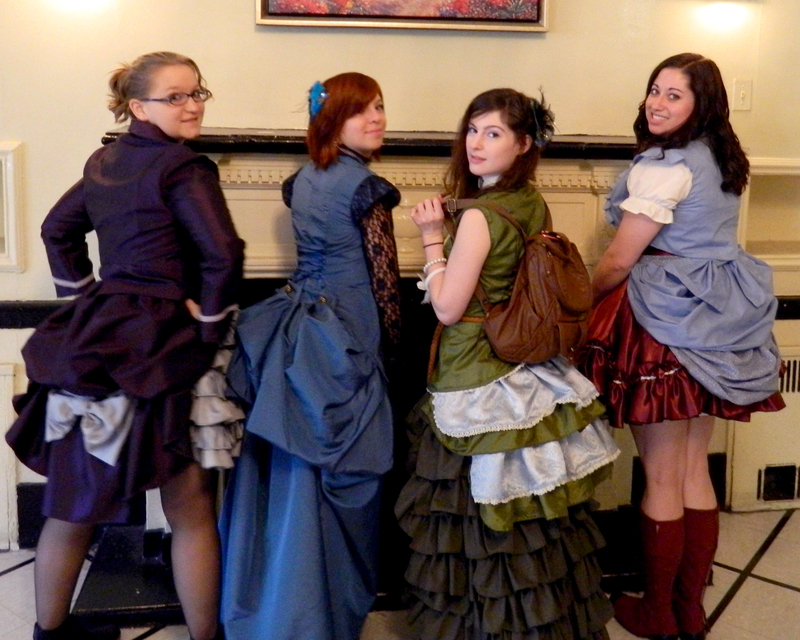 The convention itself was a great time, but mostly because of the good company. As I said, the convention was too crowded to take pictures at, so I don’t have much else to report! 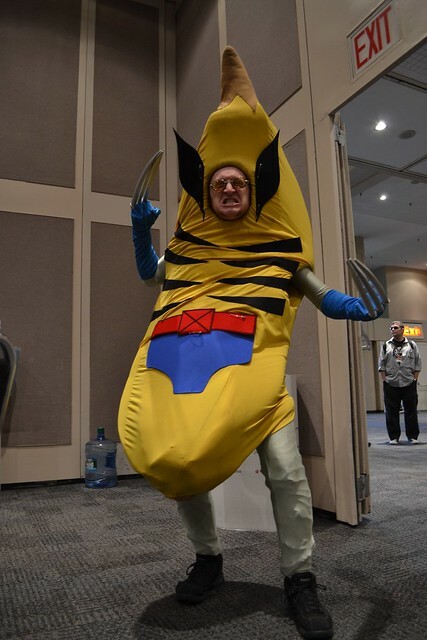 Again, I will hopefully have more, and better pictures of this costume next month. 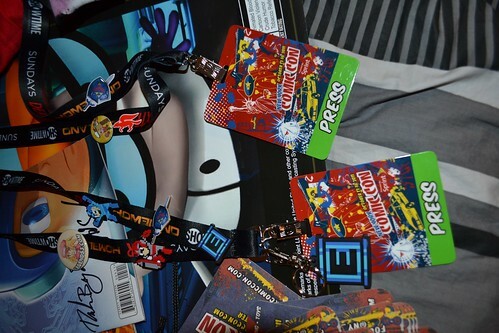 2011 was my first year attending New York Comic Con, what I thought was the Holy Grail of East Coast Con-ing. 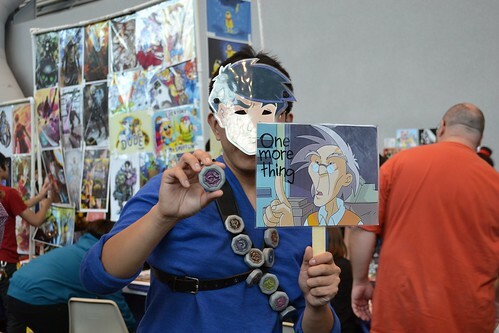 It’s the largest comic convention on the East coast and with that title comes a lot of hype. 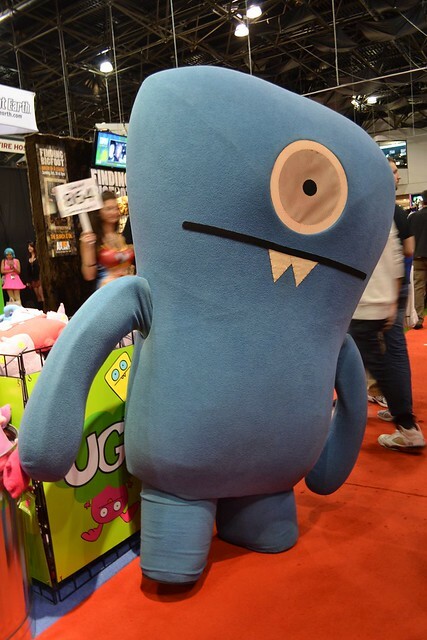 My expectations were set pretty high for this convention because of how much attention it gets on television stations like G4 and Funimation, which plays clips from the NYCC all year-long. Because of the extensive media attention, the pressure was on to deliver the kind of experience promised in those flashy adds. 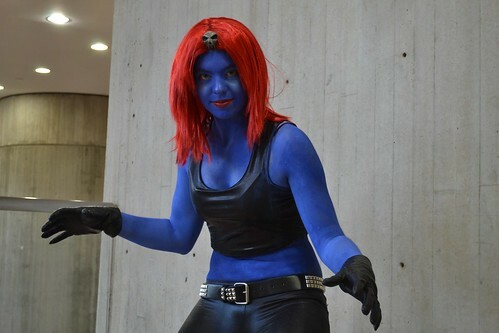 In this review, I will give an honest account of my Comic Con experience. This review expresses my opinion, and my opinion only, unless otherwise stated. 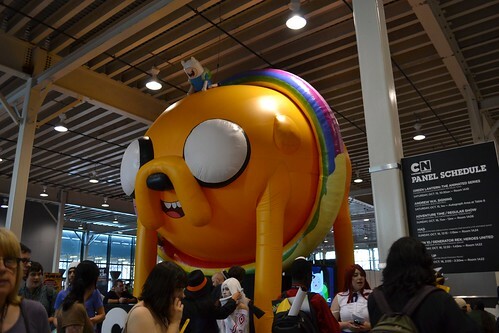 I consider myself a pretty average con-goer in terms of what I attractions I like to see, and what topics interest me. I hope that by sharing my convention experiences, other con-goers will use this knowledge to have more fun in the future; whether that means planning ahead to avoid the problems that I encountered, or making sure to see a certain attraction next year. I also hope that these convention reviews will help con-goers make an educated decision on whether or not to attend that convention in the future. Time & Location Mid October is a lovely time of year for a Convention in most cases. The weather isn’t too cold, but you also won’t be hot, and it is a fairly dry time of year. 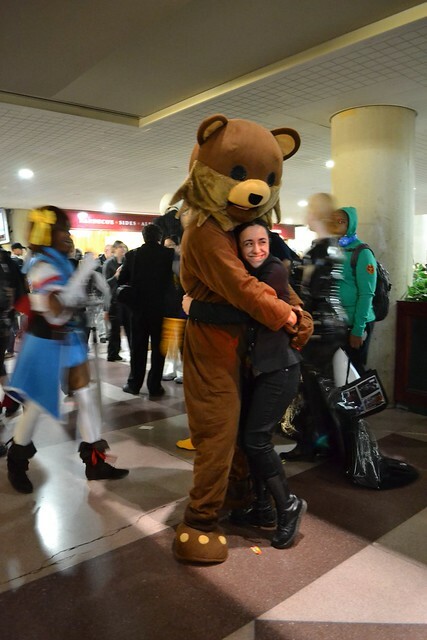 Unfortunately, Friday of New York Comic Con, which was on Oct 13-16 (yes, four days) was hot, sticky, and rainy! Ick. Saturday and Sunday, fortunately had much nicer weather. Though I am a fan of the time, the location was not my personal favorite. I do not love New York City (if you do, you can skip this part); I find New York to be a really really uncomfortable place to exist. Everyone is in such a rush, no one is friendly, and we had a lot of people asking us for money all weekend. The city is really dirty and we were constantly walking through pockets of bad air that smelled of feces, gasoline, rotting food, and smoke. The subway is also dumb; you would think that you could get on a train heading in the correct direction, and by transferring to other trains, get where you need to go easily. This is not the case. The subway system is extremely disjointed, it doesn’t cover the whole city, and the maps are terribly hard to read. New York City is also not a great place if you are on a budget. I found food prices to be at least 50% higher than in Boston and Hartford, cabs are expensive (and with the traffic they won’t get you anywhere fast anyhow) and hotels start at $200 a night if you want the most basic of comforts. No, New York City is not my favorite. 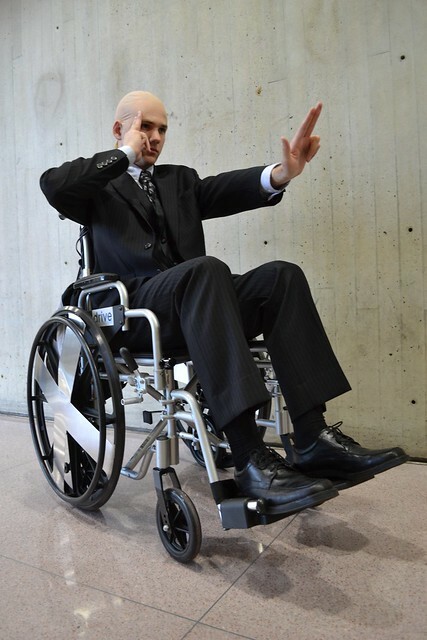 The convention did make a small effort to make guests more comfortable however with hotel blocks and shuttles running back and forth from the hotels to the conventions. The hotels were all far away, however, and though I didn’t take the shuttle myself, I heard that you had to wait around for it. Still, it’s a nice offer, and I only wish that there was enough convention hotel space, at a low enough cost, for more of their guests to enjoy it. Show Floor One of the biggest draws of this convention is the show floor, similar to a dealer’s room at other conventions. 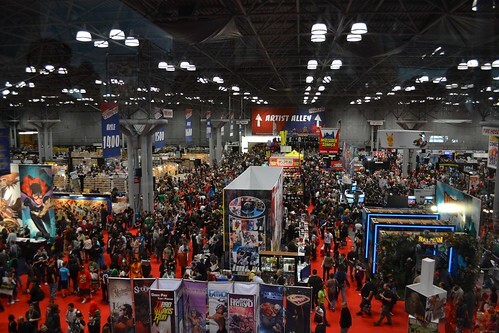 It is an absolutely massive room, filled with vendors, artists, and industry leaders like Marvel, DC, Dark Horse, Capcom, and Ubisoft. Obviously the vendors and artists are there to try to sell you stuff, but the industry booths are there to let you play their unreleased games and give you free stuff, which is awesome. Nintendo was particularly generous this year, offering a different free souvenir for each awesome, unreleased or brand new game that you tried. I collected quite a bit of free stuff over the course the weekend, either by playing games, standing in a short line, or just walking around and having stuff handed to me. 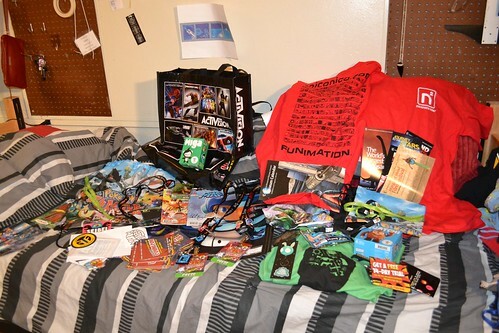 You can read more about the free stuff that I got in this post on free stuff at NYCC. The down side of the showroom, was that it was so crowded that you couldn’t even breath. It took almost an hour to get from one end to the other because everyone was so packed in there. If you were in a costume, forget about it, anything delicate would be trashed in that mob. Lots of pushing, shoving, and being poked by people’s sharp props or papers. Ouch! The show room was not a place for the claustrophobic, small children, the easily bruised, short people, wide people, or the handicapped. It was actually, really annoying and uncomfortable the number of people allowed to pack into small isles and booths. Guests Another reason that Comic Con appeals to so many people is their star-studded line-up of guests. You can find people from every corner of the entertainment industry at this event: artists and editors of DC and Marvel, Japanese film director Makoto Shinkai, Mark Hamill, Jay and Silent Bob, Chris Evans, world-renowned cosplay celebrities, creators and voice actors from Cartoon Network hits, and so many others. There was an entire section of the convention dedicated to autographs, and many people of importance had booths where fans could go meet-and-great. 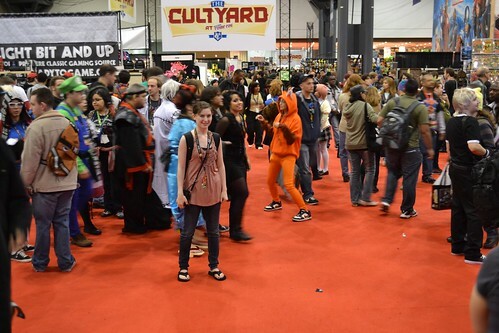 Though it was really hard to get in contact with the big-name-guests (for their own safety) it was surprisingly easy to track down and meet the sort of people who at other cons, you would stand no chance of getting near. 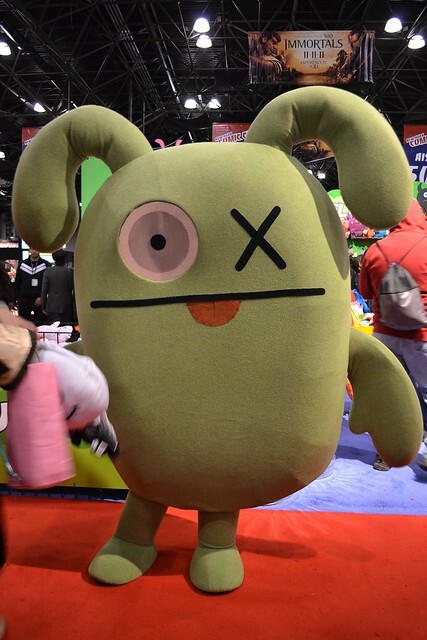 As a member of the press, I was privileged enough to have scheduled interviews with Award Winning Cosplayers Kenneth Pingad, and Yaya Han, nerd comedian and speaker Uncle Yo, and the creators and voice actors of Adventure Time and the Regular show on Cartoon network. Meeting these people was a blast and an honor, however it wasn’t that hard to find them! 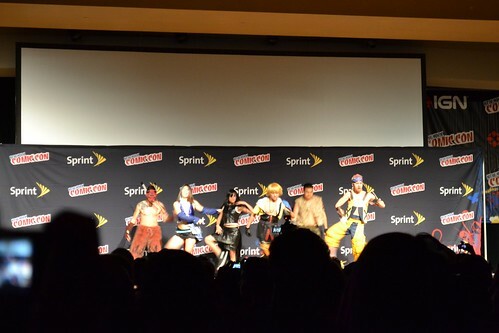 I think even if I wasn’t a member of the press for NYCC, I could have still had the chance to meet most of them. Food Food in New York, as I said, was at least 50% more expensive than Boston and Hartford. Inside the convention center, food was 100%-200% more expensive. There was a food court with pizza and Starbucks, and some stands with popcorn and pretzels. For real food you did have to venture out into the city. About four-blocks down 34th street there was a Wendy’s, a TGI Fridays, a Diner, and other places to eat. There were also food carts parked outside of the convention center all weekend. There was food around, yes, but you had to pay quite a high price for a nice place to sit down and relax. Personally, I didn’t have time to relax. I was living off food that I packed for the weekend (which saved us a ton of money BTW) and Wendy’s for dinner. 😀 I survived. OMG! We found a pocket of air big enough to take a picture in!!! Lines THE LINES! The lines were absolutely terrible!!! You go to a convention to go to panels, and main events, right? Well a lot of us do–most people like to see a few panels over the course of the weekend to feel like they got their money’s worth. Well good luck at NYCC getting into ANYTHING. 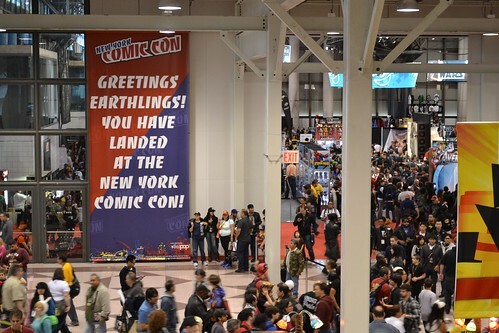 At NYCC, if you take away the value of the spectacle that is 100,000 people crammed (yes, crammed) into a very large convention center, you are essentially paying to shop and to stand in line. 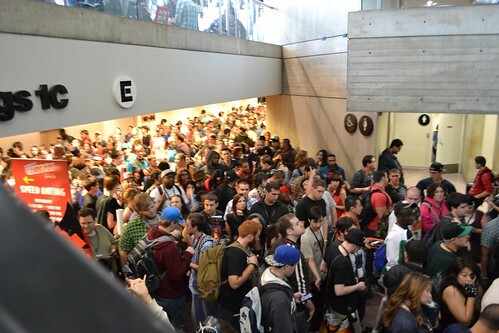 You are not going to get into any events after standing in line, you are only going to stand in line, and staff will tell you the whole time, “you’re probably not getting in.” The problem was, the convention staff were not clearing the floor between panels and main events. SO. If you wanted to see an event that started at 7pm, you had to get in line at 10am, when the convention OPENS. Here’s why. Let’s say there’s a main event at 11, 1, 5, and 7. Well, everyone wants to see the event at 7, in this case, the Avengers special super-secret unreleased footage panel. Everyone at the convention wanted to get into a room that holds 3,000 people. 100,000 people at the con….space for 3,000. See the problem? Now, there are only 5,000 people who want to see the 1 o’clock panel, but those people are going to get in line at 10. Some of them will get into the 11 am panel, but most of them wont. They just want to get into the 1pm panel. Now, people do not have to leave the main events hall when their panel is over. They can stay there all day. So. When the 11 am panel ends, not everyone wants to sit there all day, so they leave and the 1pm people go in. These people want to see the 1pm panel, and EVERYONE wants to see the 7pm panel, so they’re going to sit through the 5pm panel instead of leaving and getting back in line. This is a line. Or what is trying to be a line. Now as these people sit here (as I would if I were them) people are getting in line for the 5pm panel, and then for the 7pm panel. But wait, no one left from the panel before, so no one who lined up just for the evening panels can get in!! I got in line for the Avengers panel 2.5 hours early. But the line was already 7,000 people long because it had been stacking all day. There were no separate lines for each event, only a line for that room. Some people for the 5pm panel got in, but NO ONE who was there ONLY for the Avengers panel got it. They had to have sat through the panel, or the two panels before the Avengers panel in order to stand any chance of getting in. LAME. Main events wasn’t the only problem. In order to get into ANYTHING you had to wait in line at that room ALL DAY. What a waste of a good convention! There were no time restrictions for how soon people could start lining up, they didn’t clear the room between panels, and there was no designated seating for press. The convention invites members of the press to the con to provide it with media coverage, the write stories about it, to make videos about the con, and to spread news of the con across the land. But how are we supposed to do that when we can’t get into anything!? Now, I’m not saying that all press should get in before regular attendees, that would be silly and unfair. But there should be a very limited number of press seats, proportional to the size of the room, and a separate press line as well. That way, press is only competing against other press for the seats, and attendees competing only against other attendees. You guys want to see videos of events on Youtube, right? Well let the press in so we can film!!! All weekend I only got into two events: an Indie Toy Maker’s Panel, and the Masquerade (which I waited in line for 3 hours for). The Toy Maker’s Panel was awesome and informative, and the Masquerade was an average, middle-of-the-road show. 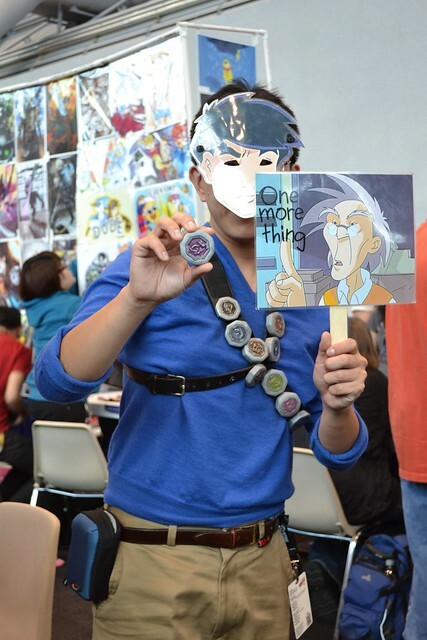 Nothing more or less special than any other con. 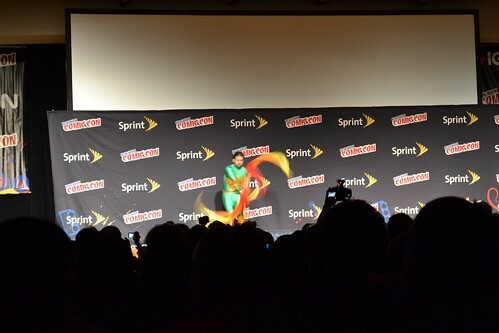 Not really what I expected from NYCC. Overall, I was incredibly disappointed with the lines and line management. There was cutting, shifting, re-ordering, and moving of the lines. I understand that it is not easy to manage such a large group of people, but having a firm plan to begin with, and sticking to the plan is the only way to keep order. Changing the structure of a line half-way through is only going to cause chaos. Staff The staff for the most part was really nice and helpful. There was a jerk or two here and there, but for the most part they were pleasant people. They were however, overwhelmed, it seemed. There weren’t enough staff to manage the volume of people and therefore, we had issues with the lines and crowd-flow. Main Events/Panels Normally I would write a whole section on what I thought of the panels and events. But, seeing as I didn’t get to go to very many, this section is going to be quite short. Again, the Toy Maker’s Panel was great: informative, fun, run by knowledgable people. We waited in line for an hour for it, and only got in because it was late-night, but still, a very good panel. The masquerade, again, not so special. A few really awesome acts, and a bunch of okay acts. If you’ve been to any masquerade before you know what this one was like. Waiting in line for the Avenger's main event, trying to have a good time. Cosplay Another area in which I was disappointed. 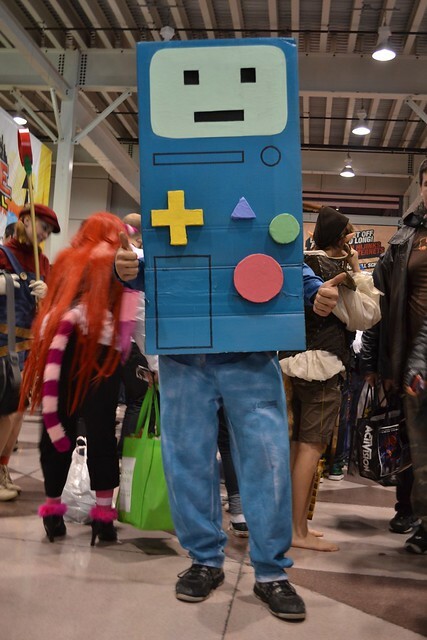 I expected the biggest convention on the east coast to have some of the biggest and best cosplay. Well, I couldn’t really find much. There were some people dressed up, sure, but the percentage of people in costume was minuscule. I understand why! 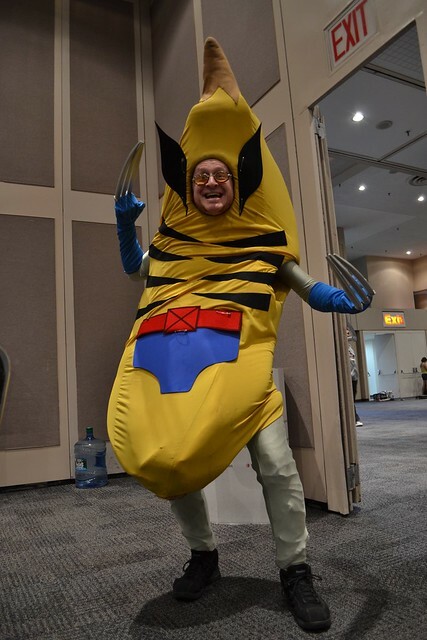 This is NOT a cosplay-friendly con. The crowds were too rough! 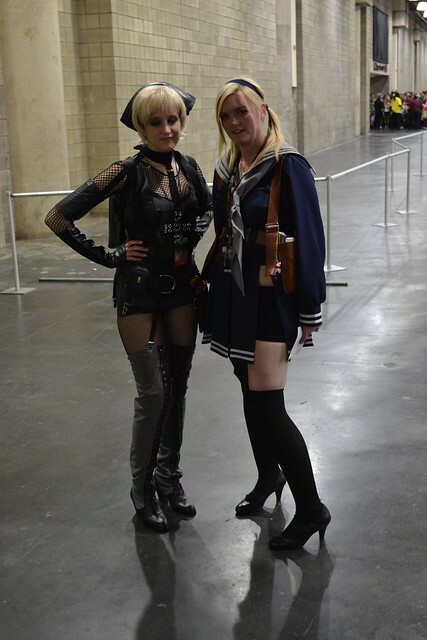 There was no room for cosplay and no room for props on the show-room. The crowds were so large that picture-taking was really quite impossible except for off to the side of the con in an unpopulated corner. Though the coat and bag check were nice options to have available, they were not complimentary, and it costed $3 to check your coat for the day (More for bags but I don’t remember the cost). Even if you checked your bag, and road the shuttle, you still had a long trip from the hotel to the convention and it wasn’t easy to get back and forth to get your things or touch up your costume when needed. Also, heels are deadly in NYC. The roads are bumpy and lumpy and uncomfortable. Because no one was getting into any panels, there was really no sitting down all weekend either. 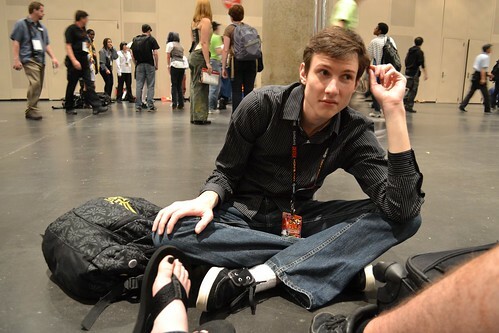 So you’re on your feet for three days straight, walking around a con and then walking to your hotel. My feet were DYING and I was wearing flat sandals all weekend. 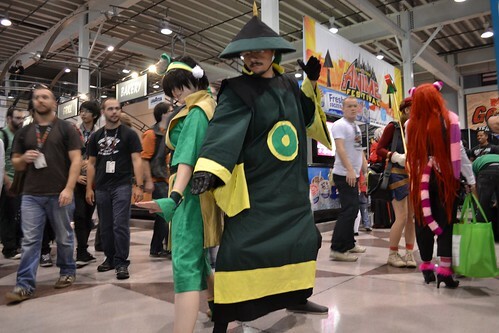 The costumes that I did see were pretty good, but it was so hard to move around, so hard to find space to take a picture in, so loud that you couldn’t get a cosplayer’s attention, so many people walking in front of the camera. Ugh! It was exhausting and I’m really glad that I didn’t cosplay. 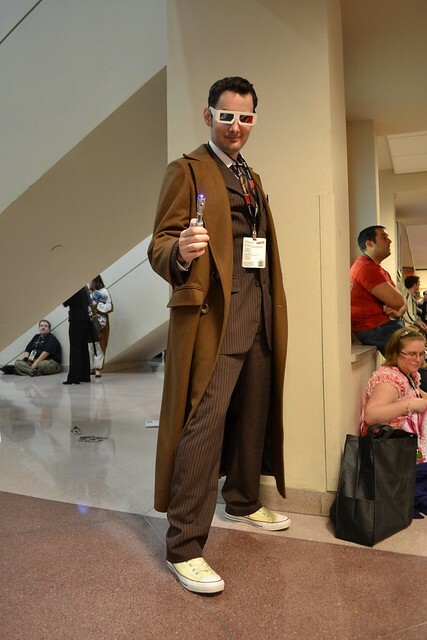 I never would have had time to see the con if I had to worry about a costume in that environment. Other Notes Price of admission is $75 for the weekend, however this does get you admission to both New York Comic Con and the New York Anime Festival, but honestly NYAF has kind of shriveled into a small extension of NYCC and I don’t really consider them separate experiences in any way. Phone and internet service is something else I would like to touch upon: there was none. You had to pay to use the Wifi, and even then it was spotty. Even Marvel was having trouble with the Wifi and had to cancel certain events that required internet access. Phone service was also very difficult to come by, making it impossible to find anyone or keep up communication. So if you are considering going next year, you’d better have a designated meet-up place, because if you get separated from your friends, good luck finding them in a sea of 100,000 people without the use of your cell phones. 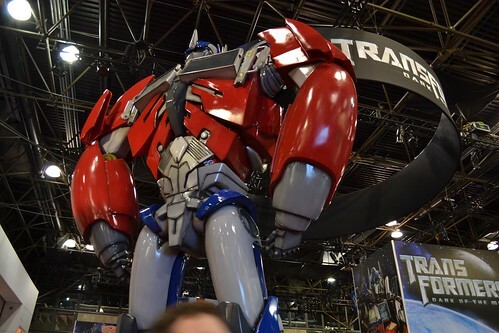 Personally, I would not pay $75 to go back to New York Comic Con next year. Even as a member of the press, who gets in for free, I would have to give it serious thought, and maybe lower my expectations a lot. I had a little bit of fun, but not a lot. It was exhausting battling all of those people, and while I liked the free stuff, I then had to carry it all, in addition to my back-pack all weekend. I packed very very light, but my back and feet were really feeling it even on Friday afternoon. I also would have had a better time if I had gotten into more events. Wandering the halls gets boring, but waiting in line is depressing too! All I wanted to do was see some cool panels, but that proved near impossible. 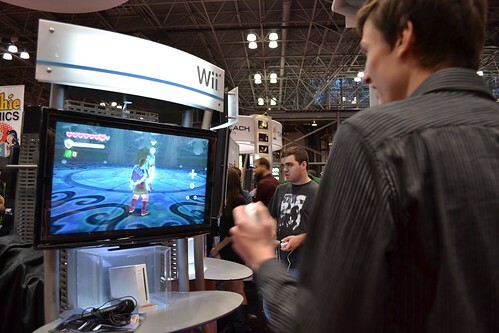 I am giving New York Comic Con 2011, a 2.5 out of 5 stars. I like free-stuff, cool guests, and playing games, but I don’t like waiting in line all day, getting trampled, getting lost, not getting into panels, and not having cell phone service. 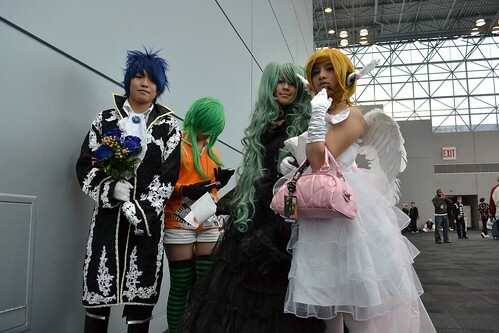 Below is a collection of Cosplay photographs that I took on Saturday at New York Comic Con 2011, and the New York Anime Festival. If you see a photo of yourself, and would like me to send it to you, send me an email! Video Interview with New York Comic Con 2011 Masquerade Winner, Kenneth Pingad. I think that the title speaks for itself. This interview was filmed hours before his latest win as, “Best in Show” in the 2011 New York Comic Con/ New York Anime Festival Masquerade, so we obviously didn’t touch upon that win in the interview, but we do have a video of his performance sandwiched into the interview. I’ll tell you now that my favorite part of New York Comic Con was the free hand-outs. 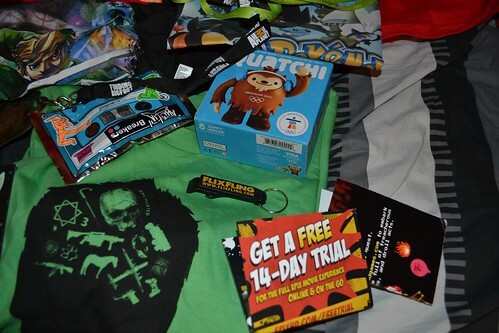 Josh and I amassed enough free stuff together that I am going to give it its own post. 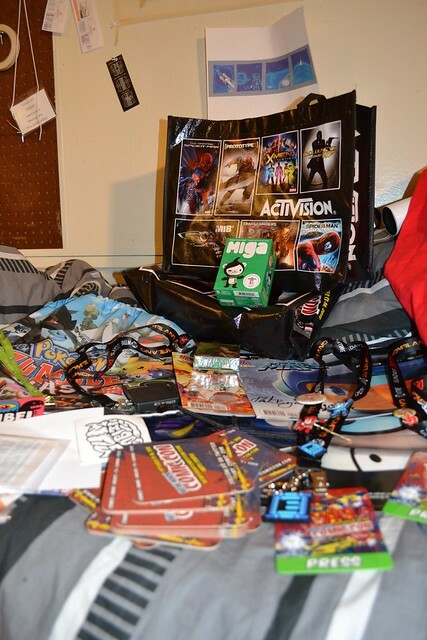 Most other cons do not give away stuff on the scale that Comic Con does. IGN even hosted a whole panel dedicated to passing out stuff to fans who would line up hours in advance for it (we did not get in, however)! Everything in these photographs, with the exception of the passes, was free!! Josh and I had a pretty good haul this year! As you can see from these photographs. 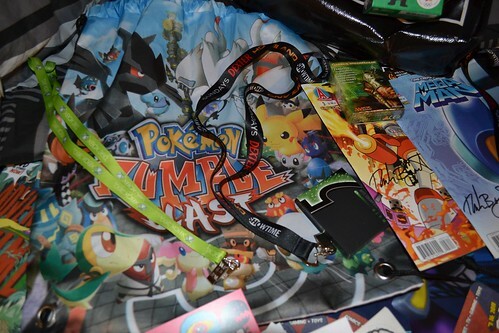 The Nintendo booth was my favorite place to get free things; they were handing out pins and shirts to anyone who tried their new games. 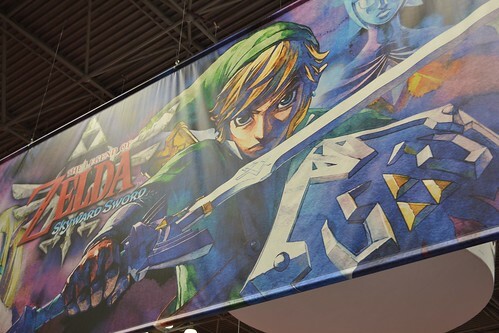 I got to play the unreleased Legend of Zelda: Skyward Sword, and afterwards I received a free Skyward Sword T-shirt. 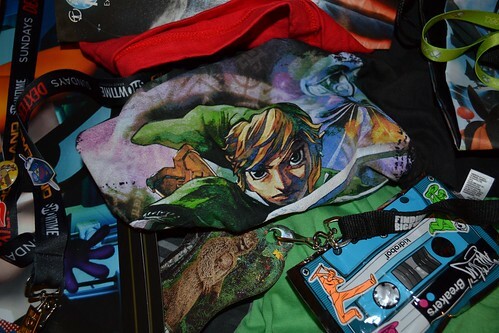 I also played Ocarina of Time, Starfox, and Pokemon Battle Rumble on the 3DS and got pins and a pokemon draw-string bag. There was a woman passing out posters from a Cartoon Network game, and I got a bottle cap opener for giving a free-movie site my email address. 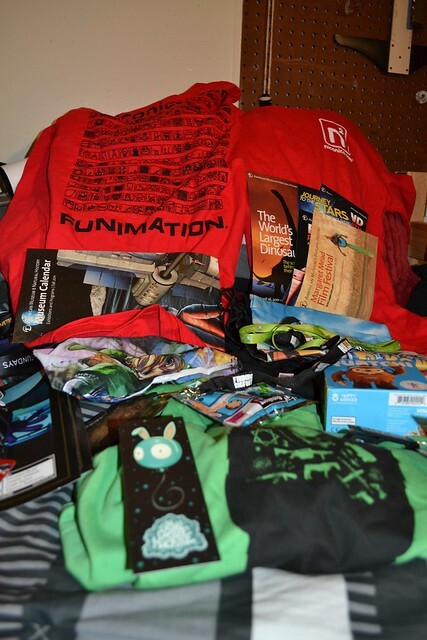 While Josh was walking around sunday, he snagged us two Funimation shirts and Ativision tote bags. While he was exploring the show-floor, hunting for SWAG, I was playing Uncharted 3, and unreleased 3rd person shooter for the PS3. My team won, and so we all got free shirts. There were also tons of people handing out post cards and flyers and business cards all weekend. Which still counts as free stuff, even if it is mostly printed SPAM. Some of it has really cool artwork on it. Vendors were also often handing out stickers with their websites on them. Kind of like a business card, but more people want it. Let’s see… someone handed us some X-box 360 lanyards and Josh got two free Mega-man comic books signed by the author just for waiting in a short line, while I went over to the animal planet booth to get a big-foot lanyard. Finally, we also experienced a glorious instance of free-stuff when we attended the “Indy Plush Maker’s Workshop.” After telling us about their toys and the industry, the toymakers threw free toys at the Audience. Josh and I each got a medium sized toy from Kid Robot, as well as a pack of little dancing guys, called “Breakers” by the Kid Robot peeps. We also got some pins from “I Heart Bears.” Mine is a bear dressed as Rogue from the X-men. 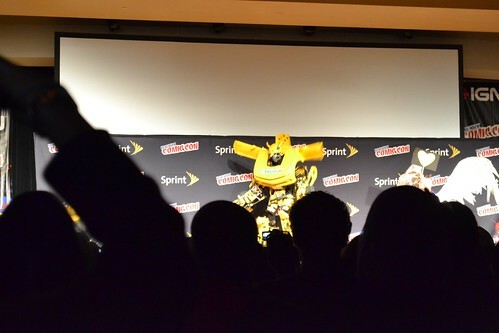 My review of the NYCC will be up soon, and you can then read how I felt about the rest of the convention. As for the free stuff, I loved it!! Here is a little video I made giving an overview of the crowd and atmosphere at this year’s New York Comic Con. You can think of it as teaser content. Enjoy.